An opportunity has been created with multiple services; lots of different technicians or local crew etc. At some point after the opportunity has been created the timings change and each service needs to be changed to reflect this, this can also happen due to simply not knowing the final times at the point of quoting. At the moment you have to edit each individual service to change the dates. Often this can be incredibly time consuming. It would be massively helpful if there was a way to change the dates on multiple services at once, either by changing the default dates on the group they are in or being able to select multiple services to then edit together. We are really fond of the service picker that is new to the mix, it works great. However if we want to add a service for a couple of hours, or just one out of multiple days that the job runs for there is no option for that. Is it possible to get an option to get hour or days instead of quantity in the service section? This to add crew for just a couple of hours. I would like to be able to filter out any resources on the planner that don't need to be allocated during the given time frame. That way I can look ahead and see if any of the upcoming opportunities still need crew or services allocated. Currently I either have to check each job individually or scroll through all available services to see if any aren't assigned to someone. In the new system only unbooked services show up so if I open the calendar and don't see any service lines only people, that means all services have been allocated to a person or vehicle. We have set prices for Delivery & Collection charges based on miles from the warehouse, however we also have some clients who are on special rates for these Services. It would be very handy and a lot easier to manage if you could set a special price against an Organisation for any Service in the same way you can against Items so that as soon as the Service is selected their special rate is brought in. At the moment any special rates have to be as another Service and Users then have to remember who is entitled to the special rates. It would be great to be able to add product accessories to services such as delivery services. This way we can have a list of tools that could automatically be assigned to certain type of delivery service. JOB STATUS: You are expected to work this event. If you can no longer fulfill your obligation, YOU MUST contact me to find a timely replacement. It would absolutely streamline a large number of Opportunities for me if it was possible to create 'packages' of services in a similar way to how you create packages of products with the 'Accessory' function. For example, we often supply live musicians from a database of freelancers as part of an event. If we had a 'package' within the Services that reflected a typical line-up of musicians, it could be added in one go, and the individual services contained within would all appear in the planner to be resourced. Much quicker than repeatedly adding "Male Vocalist", "Drummer", "Keys Player", "Sound Engineer" as individual service items, especially when sending out seven piece bands with crew to multiple events. Same could apply for combining vans with drivers and crew members, or an audio crew with specific specialisms if the same configuration of services is regularly dispatched. The services module is great. Using it for all jobs now. Only thing that would be nice is a electronic way to confirm contractors on jobs. Similar to the online quote accept. You send them a link, they click yes or no and then it gets the appropriate status after that. Also the iCal feeds for each contractor/employee show up the events even if they aren't confirmed. Would be good if it didn't go in there iCal feed till they are confirmed onto the job. Require a driver to be allocated to a vehicle. 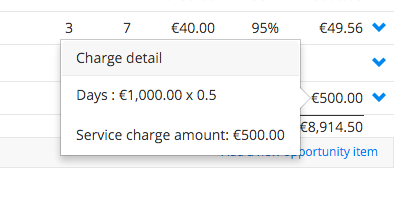 Add a "weekly" rate type for a service opportunity item - so that we can bill our services in the same way as our products. Day and half day rates tend to be used for crew hire. Currently there is only day or hourly. Please can we add in half day? Thanks for your comment. In Current RMS, we give you the flexibility to charge for your services using a day rate, hour rate, distance rate (per mile/km), or a flat fee. If you’d like help with this, just let us know at help@current-rms.com. We really need a function where once a job has been created, I can then see the individual weights of each item in a list and then allocate them to the different vehicles being used on that job. The vehicle should then be able to show as full if the volume or the weight exceeds it's capacity. Obviously the load list would be divided into the vehicles. is there a way to set operational hours and individual hours for bookable resources without making a new activity every single day? Like setting operational hours for the store so you only see 9-5 or whatever those hours are. Or setting individual availability for bookable resources like student employees? this would be very helpful. It would be useful to be able to book crew from their booking sheets rather than have to go into each individual job. Be able to change which status of opportunities show in the resource planner. So the planner is not full of un-booked/reserved events. Once jobs are confirmed by Account Managers new jobs appear in job planner view in red. It would be great if the Operations Manager could indicate he is aware (accepted) and has been handed the confirmed job by a tick box which would show on the job planner view. I am currently using a workaround by editing the subject line and putting in an asterisk at the start of the subject line. This lets the Account Managers know I am now managing the rostering of crew etc at a glance by viewing the job planner view in weekly or monthly mode. This makes it easy to see if any jobs have been overlooked, no asterisk means no crew rostering.